Again a bad year for updates as work keeps me away from the site. What time I have spent has been trying to stop the spammers from posting on the forum etc etc. 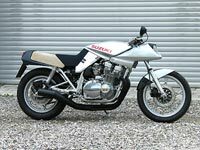 The forum is as busy as ever and I have plans to try and make that area a little better for people posting and better formatting control. 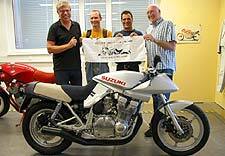 Last weekend, as planned, the Katana ED-2 Party at Target-Design took place. 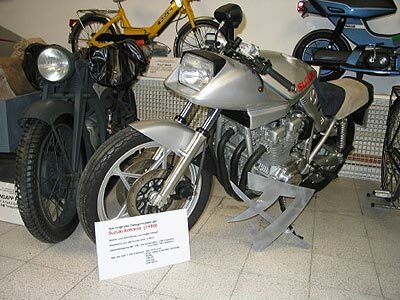 The prototye ED-2, freshly restored by Target-Design, had been handed over by Mr. Kasten to Mr. Ehn and is now to admire again at the Motorradmuseum Eggenburg. Best thank for the assistance to all parties for this felicitous event and a special thanks to the ladies of Target-Design for their cordial receiption and entertainment. 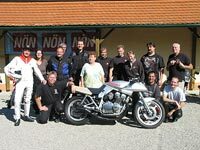 Those Katana fans which found the way to T-D were highly pleased and those which came along to Eggenburg on Saturday enjoyed the drive with great motorbike weather. 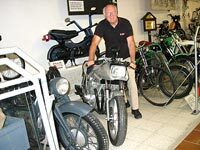 After we arrived Eggenburg, Mr. Ehn did a special guide through his museum. That day ended with a dinner in the town. On Sunday we have had a great drive through the vineyards along the river Danube, where we said good by in the afternoon.